My oldest daughter has told me several times this week that we need to go back to the store to get more lemons so we can make lemonade again. If lemon and lime trees could survive in Nebraska I would be in lemonade and margarita heaven. This is a perfect recipe to get your children involved in the kitchen. Don’t worry if any seeds get into the measuring cup you can always strain them out. 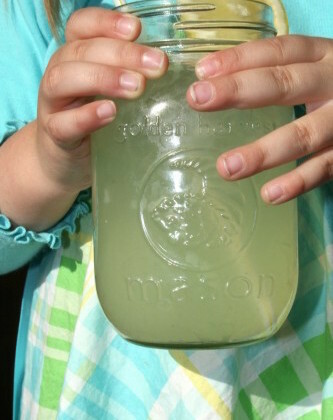 While your child/children are busy squeezing lemons you can make the simple syrup. We will be making this lemonade countless times this summer. Has anyone tried making fresh squeezed lemonade using agave syrup instead of sugar? If so please let me know. Heat 1 cup sugar and 1 cup water until sugar is dissolved about 5 minutes.Turn off and let cool. Roll lemons between your palm and the counter top to release the juices or pop them in the microwave for 5-10 seconds. Squeeze lemons until you have 1 cup of lemon juice. Strain lemon seeds from the juice. In a pitcher stir together lemon juice and sugar mixture. Add 1 quart cold water until you achieve a tart/sweet flavor your family enjoys. Serve over ice. ENJOY! I love that photo! So cute! And I have a bottle of agave syrup to use, too. I hope someone fills us in on how to use it in lemonade! Bring water and zest to slow simmer then turn off the heat and cool. Mix the lemon water, agave, lemon juice and the water in a shaker with ice. Thanks Tim! I will try this recipe next time. I love homemade lemonade! I agree with Denise that herbed lemonade is awesome. I planted some lavender this spring specifically for lemonade!